So, apparently I missed something along the way. Task in C# has an "IsCompletedSuccessfully" property (in some environments). This has been around since .NET Core 2.0, and it is in the current 2.2 release (and the 3.0 preview). The reason I love the idea of "IsCompletedSuccessfully" is that "IsCompleted" does not mean what you think it means. But there are some caveats about which types of projects can use this property. More on that below. I've been writing and speaking about Task and Await since 2015. It's one of those things that took me a while to understand and then became really useful to me. One of the hurdles I had to deal with has to do with the "Is" properties on Task. These include "IsCanceled", "IsFaulted", and "IsCompleted". The main problem with these properties is that they sound like they are mutually exclusive, meaning something will be *either* Canceled *or* Faulted *or* Completed. And that is not the case. IsCompleted will return true when the task is in one of the three final states: RanToCompletion, Faulted, or Canceled. So "IsCompleted" does not mean "completed successfully", it means "no longer running". The usefulness of this property in Task continuations is limited. And because of the problems I had when I first came across it, I have talked about it in articles (Task Continuations), videos (Task and Await in C# - Part 3), and also in my live presentations (I'll Get Back to You: Task, Await, and Asynchronous Methods). Note: the short version is that if we want to see if a Task completed successfully, we can use the Task.Status property (an enumeration) and look for "RanToCompletion". With .NET Core 2.0 and later, we finally get the option that I've been waiting for. The "IsCompletedSuccessfully" property has been around since .NET Core 2.0. Somehow I missed it. It wasn't really a surprise that I missed it because I was mainly using Task in WPF projects (.NET Framework) and .NET Standard 2.0 class libraries. This property is not available in those environments (more on that in a bit). The first thing to note is that the documentation is currently incomplete. It just tells us that the property exists, but it doesn't say what it is for. Based on previous experience (and a little experimentation), we can deduce that this tells us whether the task ended up in the "RanToCompletion" status. Also note that this applies to .NET Core only. It has been available since .NET Core 2.0, and it is available in 2.1, 2.2, and the 3.0 Preview. So, Yay! that this is available, and hmmm... let's figure out where we can really use this. The first thing to consider is that there is a difference between .NET Core and .NET Standard. With .NET Standard, we can create libraries that will compile in a variety of environments. I have created lots of .NET Standard libraries that can be used with WPF applications (using .NET Framework) and WebAPI applications (using .NET Core). This is great because .NET Standard gives us a standard set of APIs that can be used by any project that supports that version of .NET Standard. I've been using .NET Standard 2.0. This means that my libraries will work with .NET Core 2.0 (and above) and .NET Framework 4.6.1 (but more realistically, they work with .NET Framework 4.7.2 -- but that's another story). 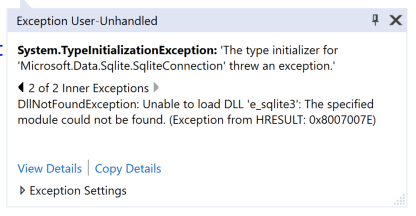 The bad news is that "IsCompletedSuccessfully" is *not* available in .NET Standard 2.0. This means that for my current projects using .NET Standard 2.0 and WPF with .NET Framework 4.7.2, this property is not available. If we do want to use "IsCompletedSuccessfully" in a class library, we also have the option of creating a .NET Core class library. This has the restriction that we can only call it from a .NET Core project, so it will not work with a .NET Framework project like our .NET Standard libraries do. 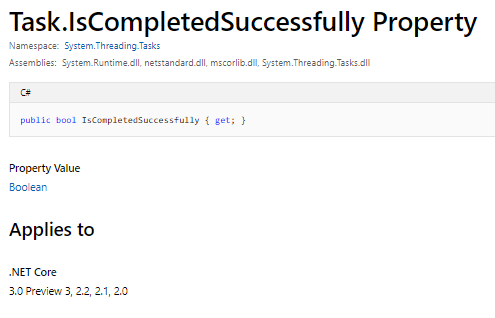 The good news is that "IsCompletedSuccessfully" *is* available in .NET Standard 2.1. It's important to understand that .NET Standard 2.1 is not really available yet. This will come along with .NET Core 3.0 which is still in preview. To make things more "interesting", .NET Standard 2.1 will not be supported by .NET Framework 4.8. Here's an excerpt from Microsoft: "Announcing .NET Standard 2.1". "Given many of the API additions in .NET Standard 2.1 require runtime changes in order to be meaningful, .NET Framework 4.8 will remain on .NET Standard 2.0 rather than implement .NET Standard 2.1. .NET Core 3.0 as well as upcoming versions of Xamarin, Mono, and Unity will be updated to implement .NET Standard 2.1." So, we will not be able to use this property with .NET Framework 4.8. With all of the changes that are happening in the .NET ecosystem, it is becoming more and more clear that we should be moving to .NET Core. For 2 examples, (1) .NET Framework 4.8 will not support .NET Standard 2.1, and (2) several C# 8 features will not be implemented in .NET Framework 4.8. 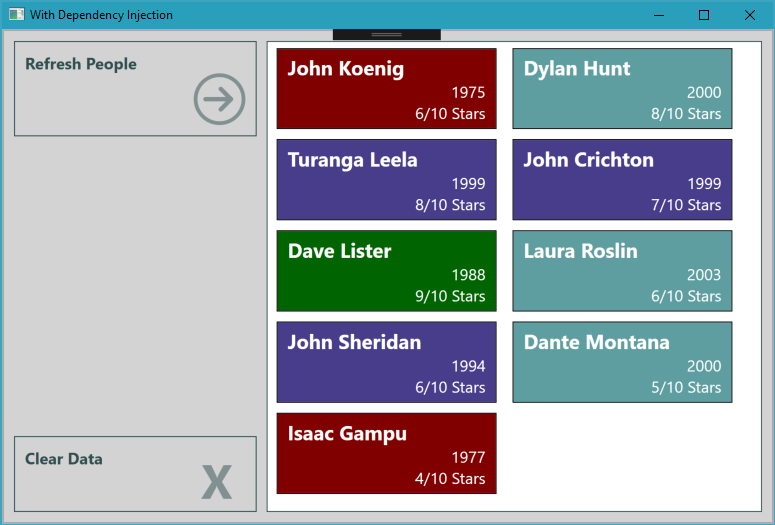 .NET Core 3.0 supports WinForms and WPF applications. I've done a few experiments with the Preview of .NET Core 3.0, and it works pretty well for the WPF applications that I've converted. If we start to move to .NET Core, then things get easier in a lot of areas. The project systems are more compatible, we get runtime enhancements, and we can use .NET Standard 2.1. We are in bit of a transitional period here. .NET Core 3.0 is still to be released. And even though Visual Studio 2019 works well with the .NET Core 3.0 Preview, the tooling for WinForms and WPF does not exist yet. There are some ways that we can manage WPF projects today, and I'll show that in an upcoming article. 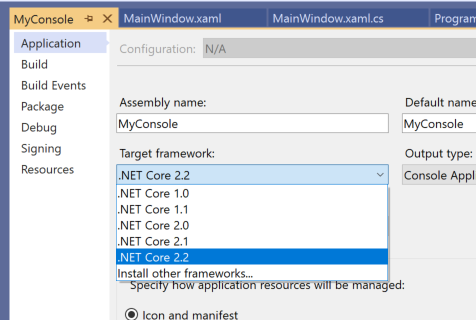 If you haven't done so already, take a look at .NET Core. This is the future of .NET. Visual Studio 2019 just released (okay, it releases on Tuesday), and you're probably anxious to try out .NET Core 3.0 -- but that has *not* been released yet, and release date is TBD. 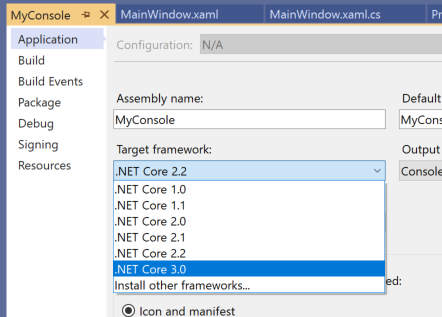 But you can still download the .NET Core 3.0 Preview and use it in Visual Studio 2019. But it is not available by default. Here's the short version: you have to enable it explicitly in Visual Studio. From the "Tools" menu, select "Options", then navigate to "Projects and Solutions". Under there, you'll find a ".NET Core" node, and that has the setting we need. 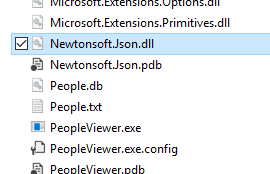 Just check "Use previews of the .NET Core SDK", and you're good to go. A big thanks to Brian Lagunas' video that showed me how to do this: [SOLVED] .NET Core 3 is not working with Visual Studio 2019. So a couple weeks ago, I was excited to try out some .NET Core 3.0 (Preview) stuff to see how it works. 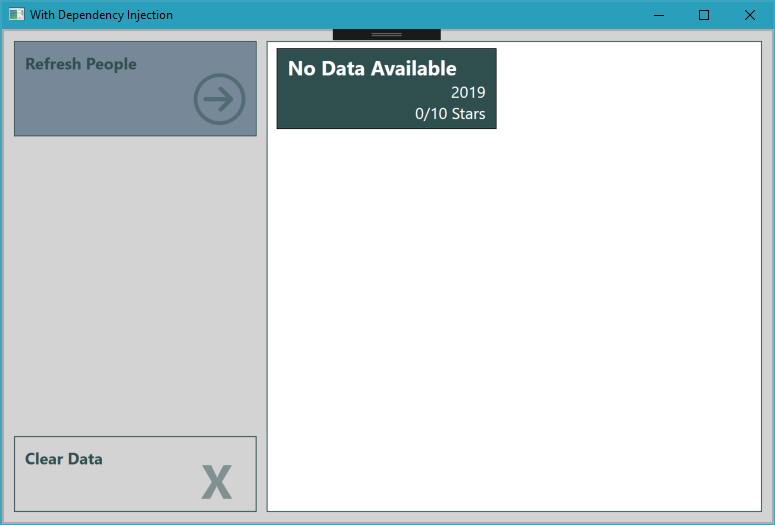 Since we are really close to launch for Visual Studio 2019, I grabbed the latest version (which was the RC (release candidate)). Then I created a new .NET Core console application. 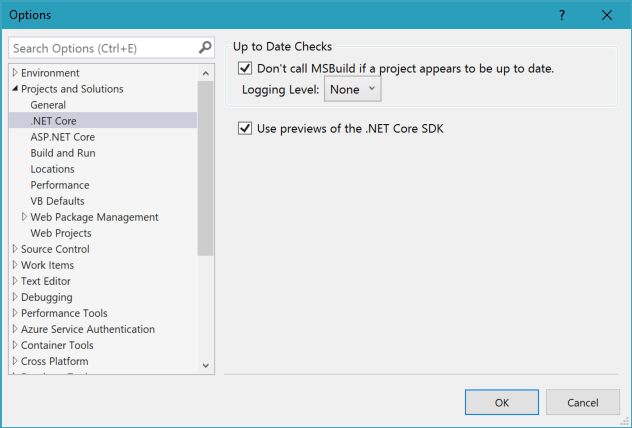 The new project dialog does not have a way to select the .NET Core version, so I figured that I would just go to the Project Options and change it myself. A quick search led me to Brian Lagunas' video (mentioned above). 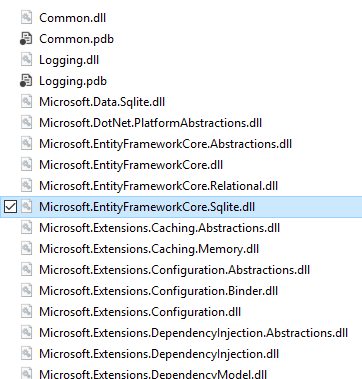 So then all I needed to do was go to Tools -> Options -> Projects and Solutions -> .NET Core. Then I just checked the option for "Use previews of the .NET Core SDK". And then I was working with .NET Core 3.0 (Preview). My initial impressions of .NET Core 3.0 are good. This is especially important when we look at what's happening with the .NET ecosystem (more on that in later articles). I was most curious about the WPF support. 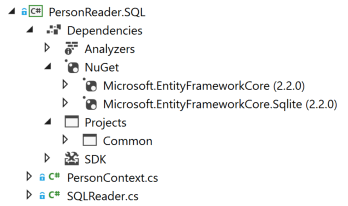 I've converted most of my sample applications to use .NET Standard for the libraries, and .NET Core for the services. But I still have some WPF projects which are .NET Framework. So I've got some more exploration to do. There is also a bit of untangling because some features are cross platform, some are not. Also, since .NET Standard 2.1 does not support .NET Framework, there are some things that we need to be aware of -- particularly since there is one specific feature that is in .NET Standard 2.1 that I'd like to start using as quickly as possible. Small pieces of functionality are easier to test. By stacking decorators, we can mix and match the pieces of functionality that we need. All of the decorators wrap the interface "IPersonReader" and also implement the interface "IPersonReader". This means that the decorators can wrap other decorators. Let's see how this works step-by-step. For this article, we'll modify the "ComposeObjects" method in the startup of our application. 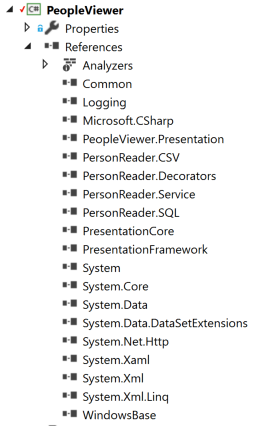 This is in the "PeopleViewer" project, App.xaml.cs file. We'll start with just the behavior without decorators: using the web service data reader. As a reminder, the code shown here is different from the final code in the GitHub project. If you'd like to follow along, just replace the code in the "ComposeObjects" method with what we have here. This method puts together 3 objects. Starting from the last line, (1) we create a MainWindow instance; this is the main form of the application. 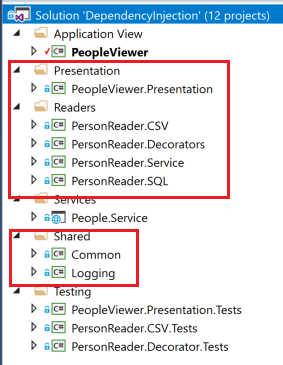 The MainWindow needs a view model, so (2) we create a PeopleReaderViewModel instance to pass to the MainWindow. The view model needs an IPersonReader, so (3) we create a ServiceReader instance (to get data from a web service) and pass that to the view model. As an alternative to this syntax, we can also use a "nested" syntax that gets rid of the intermediate variables. This is in the "AlternateComposeObjects" method in the same file. This is a little easier to read since we can see what is nested in what. 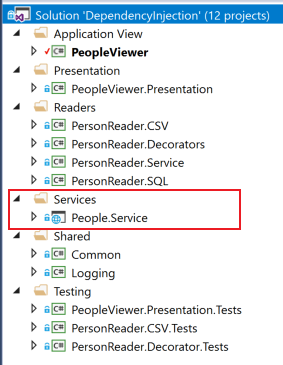 The "ServiceReader" is nested in the "PeopleReaderViewModel" which is nested in the "MainWindow". I'll show both of these syntaxes along the way. They both have their pros and cons when it comes to readability. As a reminder, to run the application we need to start the web service. This is in the "People.Service" project. The easiest way to start the service is to navigate a command window to the project folder, and type "dotnet run". This shows the service listening on "http://localhost:9874", and you can navigate to "http://localhost:9874/api/people" to see the service in action. Then we can run the application in Visual Studio. When we click the "Refresh People" button, we get data back. Now we'll go back to the command window and stop the service with "Ctrl-C". As a reminder, if the code stops in the debugger, just click "Continue" or press "F5" to run past the exception. Now let's see what happens when we start adding functionality. The first step is to add the decorator to retry the call if it fails. This described here: More DI: Adding Retry with the Decorator Pattern. 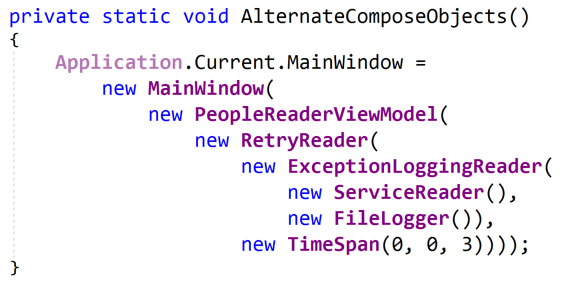 In this code, we wrap the "ServiceReader" in a "RetryReader". The RetryReader also needs a delay, so we pass in a TimeSpan of 3 seconds. When a call fails, the RetryReader will wait 3 seconds and try again, for a total of 3 attempts. After 3 attempts, it will return the exception from the wrapped data reader. We can see that the RetryReader wraps the ServiceReader. Now if we run the application and click "Refresh People" (without re-starting the service), we wait 6 seconds before the failure (due to the delay and retry). If we restart the service after clicking the button, then the retry will work, and the application shows the data. See the original article for more details. I'm a bit torn between these syntaxes, which is why I am showing them together. The nested syntax shows the relationships very easily. Here we can see that the ServiceReader is wrapped in the RetryReader which is wrapped in the ExceptionLoggingReader. But some of the other parameters are a bit more difficult to follow. If we use the original syntax, it is easier to tell that the "TimeSpan" is the retry delay since we've given that intermediate variable a name. I experimented with mixing the syntaxes, but did not like the results. If we run the application again (without restarting the service), we get the same behavior as above. 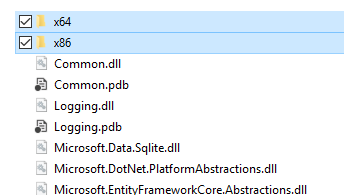 But now there is a log file in the executable folder: ExceptionLog.txt. For more details on the ExceptionLoggingDecorator, see the original article on that decorator. The view model calls the ExceptionLoggingReader. The ExceptionLoggingReader calls the RetryReader. The RetryReader calls the ServiceReader. 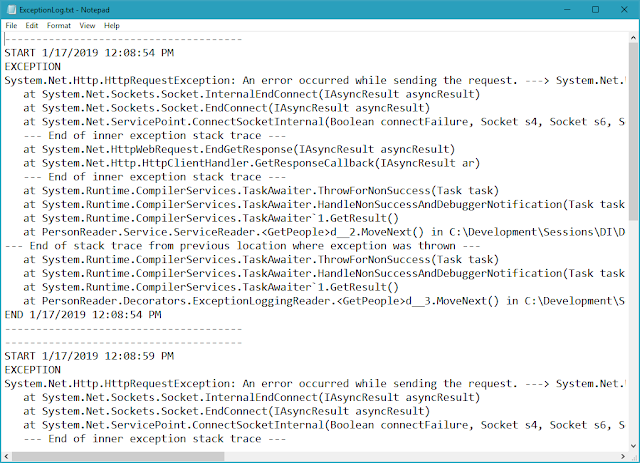 The ServiceReader throws an exception. The RetryReader retries the call. 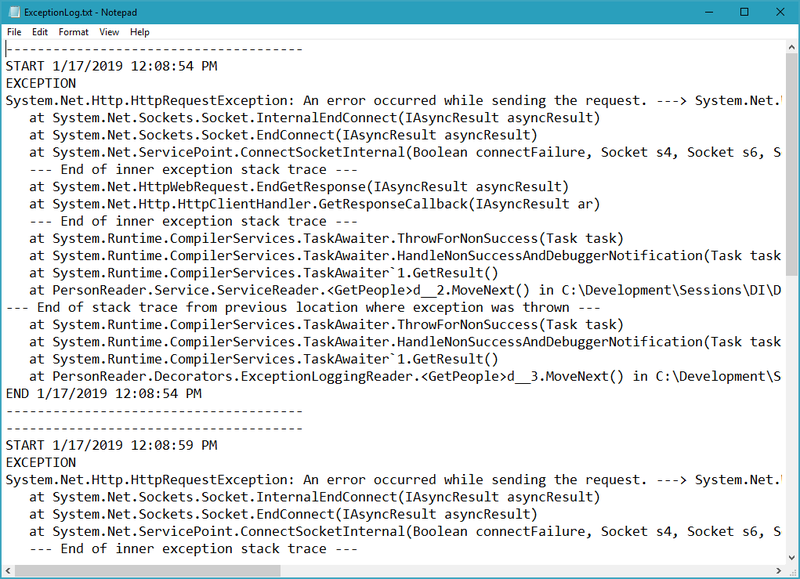 The ServiceReader throws an exception (again). The ServiceReader throws the exception (again). The RetryReader rethrows the exception. The ExceptionLoggingReader takes the exception and logs it. The ExceptionLoggingReader rethrows the exception. 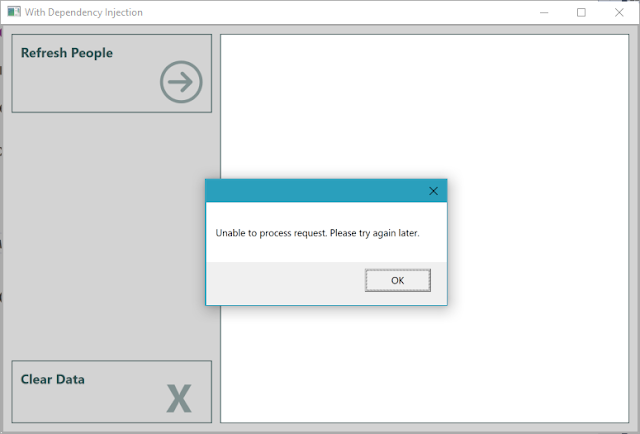 The exception bubbles up through the view model and eventually hits the application's global exception handler (that's where the pop-up comes from). The log only has 1 exception for this process. 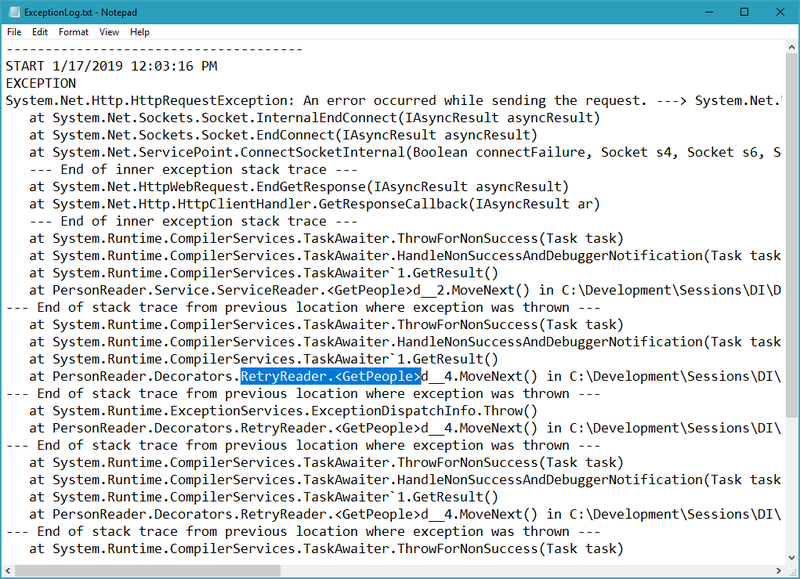 If we look in the exception log, we see the "RetryReader.<GetPeople>" call. In fact, there are 3 calls in the call stack. This is because our RetryReader uses a recursive call for the retry functionality (see the original article for details). The result is that when we assemble our objects this way, we get the functionality of *both* the retry decorator *and* the exception logging decorator. But notice that we only have 1 exception logged. That's probably what we want, but we can change that by stacking things in a different order. Something that we need to be aware of is that the order that we stack our decorators is important. Let's flip the order of our decorators. 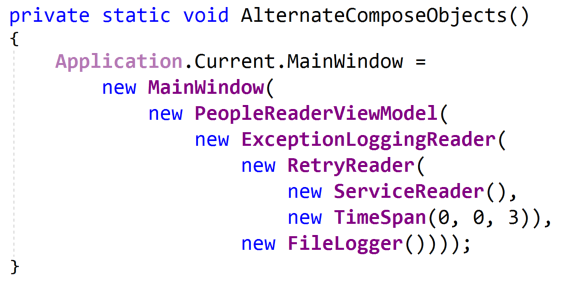 Instead of the ExceptionLoggingReader wrapping the RetryReader, let's have the RetryReader wrap the ExceptionLoggingReader. The application behaves differently now. The view model calls the RetryReader. The RetryReader calls the ExceptionLoggingReader. The Exception LoggingReader calls the ServiceReader. The ExceptionLoggingReader logs the exception and rethrows it. The RetryReader retries the call to the ExceptionLoggingReader. The ExceptionLoggingReader calls the ServiceReader. The RetryReader tries the call to the ExceptionLoggingReader. The exception bubbles up through the view model and eventually hits the application's global exception handler. Here we can see the first exception logged. Then 3 seconds later (approximately), the second exception is logged. Further down in the file, the third exception is logged. So we do need to be aware of the order we use when we stack decorators. The view model only cares that it gets an "IPersonReader". The view model itself does not need to know anything about the decorators or if they wrap other decorators. All the view model cares about is that there is a "GetPeople" method that returns data; the details don't matter. That's the magic of using the decorator pattern with dependency injection. Each decorator has a single function. This makes them easy to unit test. In our tests (retry tests, exception logging tests, and caching tests) we are able to focus on one function at a time. So our tests can be straightforward and clear. For this project, we can also add integration tests to see how the decorators behave together in different combinations (and that's something I'll be adding in the future). Dependency Injection and the Decorator Pattern are a powerful combination. We can mix-and-match pieces of functionality depending on our specific needs. Each piece of functionality is isolated so that tests can be focused. And we can get these benefits without modifying our existing classes. We just snap the pieces together in a different order. Coming up, we'll look at some other aspects of this project, including how .NET Standard projects interact with .NET Framework projects. We'll also look at using dependency injection containers to compose our objects and manage the lifetime. And we'll look at a more general-purpose interface that allows us to use the decorators with a variety of underlying objects. Network calls, whether to a web service or a database, are often the most slowest parts of our application due latency and bandwidth limitations. To minimize these types of calls, we want to add a client-side cache to the application. This cache will provide data for a specified amount of time and then hit the real data reader when it's time to refresh the cache. This will keep the network calls to a minimum. Before adding the cache, let's see how the application behaves. For this, we'll remove the previous decorators and go back to the base state. The code here is much different from what is in the GitHub project. The GitHub project uses all of the decorators, and we'll look at that in a later article. To follow along with this article, you can replace the code in the "ComposeObjects" method with what we have here. Once the service is running, we'll start the application and click the "Refresh People" button. This gives us the data from the service. Now let's stop the service and try again. To stop the service, just press "Ctrl-C" in the command window. Then in the application, click "Clear Data" then "Refresh People". The call will fail since the service is no longer running. When the debugger stops in the code, just click "Continue" or "F5" to keep running. The application will give us the generic error message. This shows that each time we click the "Refresh People" button, the application will make a call to the web service. This is the behavior that we'd like to change with the client-side cache. The first thing to note is that the CachingReader implements the "IPersonReader" interface, so it has the 2 methods "GetPeople" and "GetPerson". At the top of the class, we have a field for the data reader that will be wrapped ("_wrappedReader"). This is set from an incoming constructor parameter. 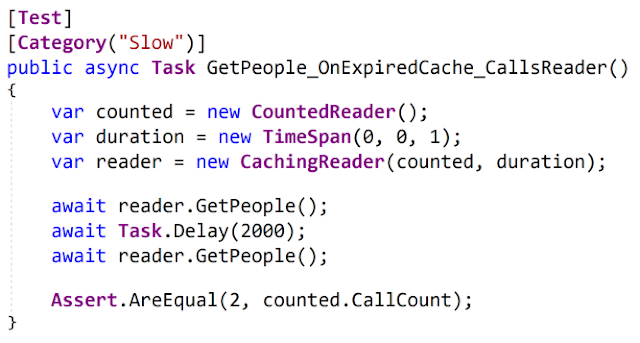 In addition, the constructor has a TimeSpan parameter for the duration of our client-side cache. This is also stored in a private field ("_cacheDuration"). The other 2 fields manage the cache. The "_cachedItems" field holds the data. The "_dataDateTime" is the time the data was last refreshed. This is used to see if the cache has expired. The "GetPeople" method validates the cache and then returns the cached items. The "if" statement checks to see if the cache is current. (We'll look at "IsCacheValid" in just a moment.) If the cache is populated and valid, then the method returns immediately, and the current cache is used. If the cache is not populated or if it is expired, then the "GetPeople" method is called on the wrapped data reader. The items returned are put into the cache and the data date/time is updated. If the call to "GetPeople" fails for some reason, then the CachingReader will return a default record that simply states "No Data Available". This will give us a value that we can display in the UI (and this works for this specific application). Another option would be to let the exception bubble up. First, this checks to see if the cached items field is populated. If it is null, then it returns "false" immediately. If the cache is populated, then we calculate the age of the cache by getting the difference between the data date/time and the current time. Then we check to see if the difference is less than the cache duration value. This returns "true" if the cache is still valid. This sets the data date/time to the minimum value for DateTime. This will make sure that the cache will be refreshed on the next call (unless the cache duration value is set to a *very* large value). The implementation of this cache is fairly naive. This assumes that the data coming back from the "GetPeople" method is small enough to be stored in memory. I've used this implementation for small data sets for a while now. But it would need to be beefed up for larger data sets. Just as we did with the retry decorator and the exception logging decorator, to use the caching decorator, we snap the pieces together in a different order. This adds the CachingReader to the object composition. Let's walk the method from the bottom up. (1) We create a MainWindow instance. This needs an "IPeopleViewModel" as a parameter. 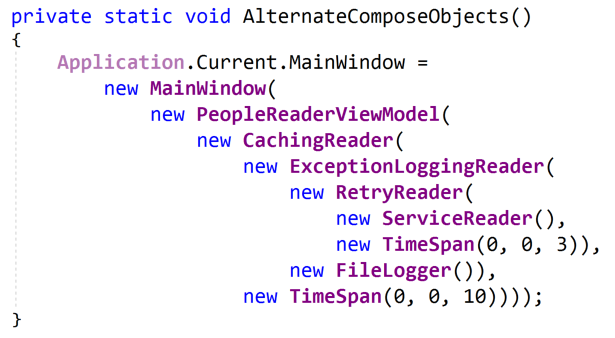 (2) So above that, we create a PeopleReaderViewModel to pass to the MainWindow. 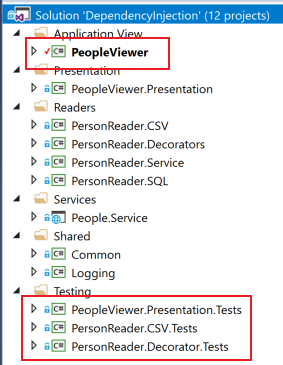 The PeopleReaderViewModel needs an "IPersonReader". (3) So above that we create the CachingReader to pass to the view model. The CachingReader has 2 parameters: an "IPersonReader" to wrap and a TimeSpan for the duration. (4) So above that we create a ServiceReader to get data from a web service and also create a TimeSpan of 10 seconds. Now we'll check the cache. Keep the application running for the next steps. With the application still running, stop the web service using "Ctrl-C" as we did above. Now click the "Clear Data" and "Refresh People" buttons in the application. This shows the client-side cache in action. Even though the web service is no longer running, we can still get data from the client-side cache until the data gets too old. Note: if the cache is expiring too quickly to see these results, just set the "duration" to a larger value in the "ComposeObjects" method above. This code works with the CSVReader and SQLReader as well. I use the ServiceReader here since it is the easiest to demonstrate by stopping the service. 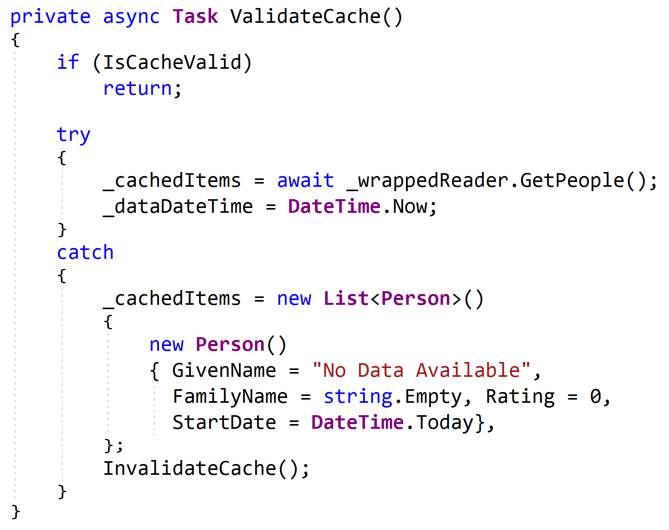 Just like with the other decorators, we want to unit test the caching decorator. The process is very similar to the previous tests, so we'll go pretty quickly through this. For more details, see More DI: Unit Testing Async Methods which shows the tests for the retry decorator. These tests are in the "PersonReader.Decorator.Tests" project, CachingReaderTests.cs file. Just like with our other decorators, we want to use a fake data reader for testing. 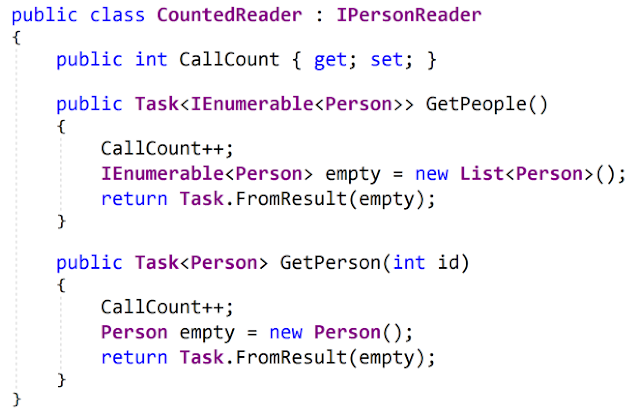 In this case, we have a "CountedReader" that keeps track of how many times the "GetPeople" method is called. Let's look at the fake reader and then come back to this test. The CountedReader implements "IPersonReader" and so has the "GetPeople" and "GetPerson" methods. The class has a public property to keep track of how many times the methods are called. This property is public, so it is available to the tests. 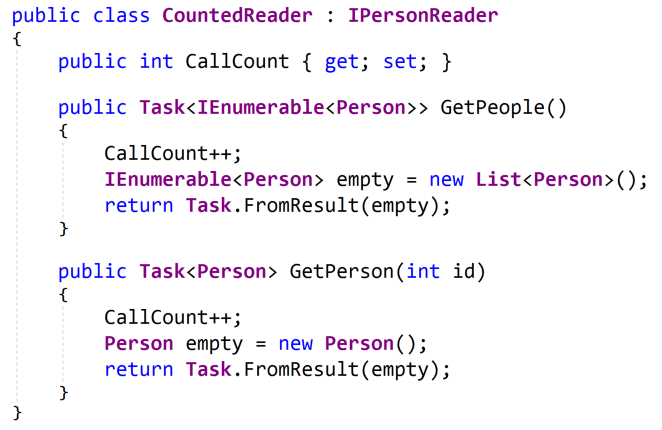 The "GetPeople" method increments the call count and then returns an empty collection of Person objects. The "GetPerson" method does something similar. We don't need any fake data here, so the empty results are fine. Let's go back to the first test. Here, we create a CountedReader and a duration (a TimeSpan of 1 second). Then we use these values to create the CachingReader. Next, we call the "GetPeople" method. Finally, we assert that the CallCount on the CountedReader is 1. This lets us know that the wrapped data reader was called one time for the test. And this is exactly what we expect. The name of the test tells how we're going to verify that the cache is being used. When the "GetPeople" method is called 2 times, we expect that the wrapped reader is only called 1 time. The setup for this test is the same as the prior one. We create a caching reader with a duration of 1 second. For the action, we call "GetPeople" twice. We expect that the second call should use the cache. Then we check to see how many times the CountedReader is called. We expect that it will be called the first time but not the second time. So, the CallCount should be 1. For the last test, we want to make sure that the reader still works after the cache has expired. 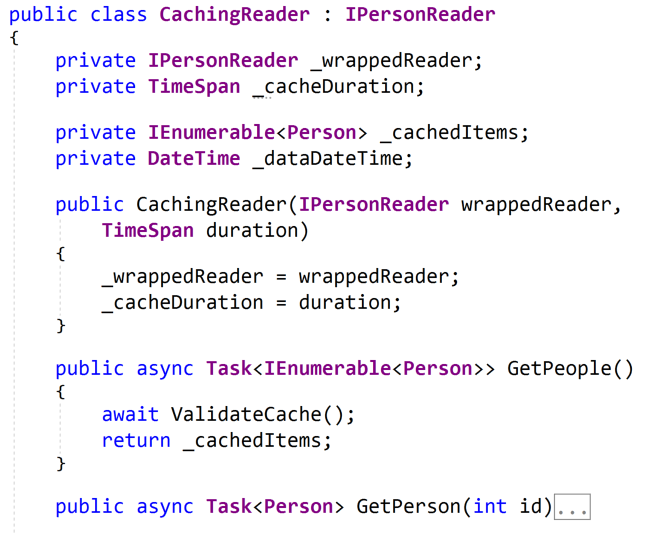 This test has the same setup: we create a CachingReader with a 1 second cache. In the action section, we call the "GetPeople" method. This should populate the cache. After waiting 2 seconds, we call the "GetPeople" method again. The cache should be expired, so we expect that the wrapped data reader will be called to refresh the cache. The result is that we expect the CountedReader to be called twice. And that is what we check with the assertion. Note: This test takes at least 2 seconds to complete. This is a slooow test, so I've marked it with the "Slow" category. It is possible to create shorter durations for the cache and for the delay, but if we cut things too fine, then we may end up with timing issues in the test. And we can see that the third tests did take 2 seconds to complete. Dependency Injection and the Decorator Pattern work really well together. We can easily add retry functionality, exception logging, or a client-side cache to our application. We just need to take the loosely coupled pieces and snap them together in a different order. It seems like I'm repeating this quite a bit. And that's because it is so important. Decorators let us add functionality in pieces. These atomic units are easier to test, and we can compose them in whatever order we like. Since our decorators wrap "IPersonReader" objects, and our decorators are "IPersonReader" objects, we can have our decorators wrap other decorators. This will stack the functionality so that we get all of the features that we want. That's what we'll look at next time. So be sure to check back.